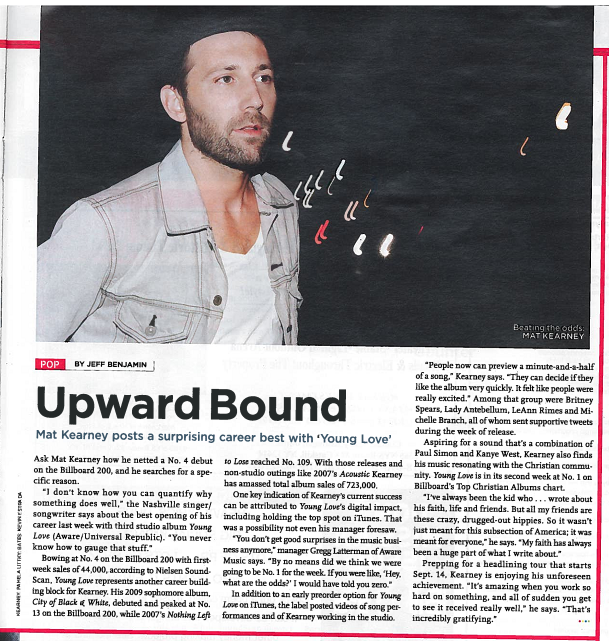 My “Happening Now” feature on Christian rock singer Mat Kearney who reached a career best with his fourth album “Young Love” reaching No. 4 on the Billboard 200 with 44,000 copies sold. What my editors wanted to know is how this happened. In my piece I looked into what strategies the singer and his team used which included a heavy emphasis on digital marketing as well as taking advantage of social media including positive tweets from the likes of Britney Spears, Lady Antebellum, LeAnn Rimes, and Michelle Branch. The piece was also chosen for a tag on the cover (left) under the ‘PLUS’ section. This entry was posted in Billboard Magazine, Feature Articles, Interviews. Bookmark the permalink.